On January 22, Pete Tong kicked off his newest venture, Essential Mix Live. After having promoted artists from various areas of the electronic spectrum for the past few years, his move to the musical hub that is LA has inspired the stalwart to launch a series of live Essential Mix broadcasts to embody the influx of musical ingenuity coming out of the city. 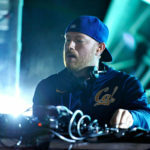 Before the main event at Exchange LA, headlined by Richie Hawtin, Tong threw a private party on a rooftop in West Hollywood, inviting a star-studded lineup including Eric Prydz, Claude Von Stroke, MK, and more to join him in a celebratory B2B extravaganza while also interviewing them about the current state of the industry. The affair was recorded by BBC Radio 1, and is now available for listening on Radio 1’s website.